It is called with many different names such as Hagia Sophia in Greek, Sancta Sophia in Latin, The Church of the Divine Wisdom in English, Aya Sofya in Turkish. It was mistranslated as Saint Sophia also. It is a former Byzantine church and former Ottoman mosque and today museum in Istanbul. It has always been the precious of its time and today it is a perfect synthesis where one can observe both Ottoman and Byzantium effects under one great dome. Hagia Sophia’s influence, both architecturally and liturgically, was widespread and enduring in the Eastern Orthodox, Roman Catholic, and Muslim worlds alike. Today unfortunately nothing remains of the original oldest Hagia Sophia, which was built on the same location where there had been a pagan temple before, in the 4th century by Constantine the Great. The first church was known as the “Great Church” or “Magna Ecclesia” in Latin. This church was largely burned down in 404 during riots since patriarch John Chrysostom was sent into exile by the Emperor Arcadius. Following the destruction of Constantine's church, a second one which was burned down during the Nika riots of 532, was built by his son Constantius and the emperor Theodosius the Great on 10 October 405. It was rebuilt in 537 with Emperor Justinian’s order. He ordered that a temple “like nothing seen before since the day of Adam or can be seen in the future” be built immediately and it was designed by two architects, Isidore of Miletus and Anthemius of Tralles. Indeed, Anthemius was a mathematician and physicist, and Isidore was a professor of geometry and mechanics and none of them is known to have any building experience before Hagia Sophia. But they could create one of the most significant monuments on earth. These architects’ work was a technical triumph, even though the structure was severely damaged several times by earthquakes. Many materials had been brought from all over the empire, including yellow stone from Syria, porphyry from Egypt and Hellenic Columns from the Artemis Temple in Ephesus. More than ten thousand people worked for the construction and the third church was inaugurated by the emperor on 27 December 537. The mosaics were finished later on, during the reign of Justin II (565-578). Hagia Sophia’s architectural mastery was far ahead of its time and unmatched for 1000 years. It is certainly a masterpiece of architecture since it is one of the few structures of such huge dimensions to have stood erect for so long. The dome of the Hagia Sophia, with its diameter and height -102 feet (31 m), is among the largest in the world. The original dome of Hagia Sophia collapsed after an earthquakes and its replacement fell in 563. The earthquakes on August 553 and December 557 caused cracks in the main dome and the eastern half-dome, and with the earthquake on 7 May 558, the main dome collapsed completely while destroying the Ambon, the altar and the ciborium over it. In 726, all the icons, religious pictures and statues were removed from Hagia Sophia by the orders of Emperor Leo the Isaurian, as he was against the veneration of the images. Emperor Theophilius (829-842) who had interest in Islamic art had monograms installed at the southern entrance of the church. Hagia Sophia took damage with the fire in 859, following an earthquake on 869. At this earthquake, a half dome collapsed, but then repaired by the order of Emperor Basil I. In 25 October 989, the dome of the basilica again got damaged by an earthquake. This time the Emperor was Basil II, and he ordered the architect Trdat to repair the dome. The construction finished in 13 May 994. In 1204 it was plundered by Crusaders so most of Hagia Sophia's riches can be seen today not in Istanbul, but in the treasury of St. Mark's Basilica in Venice. 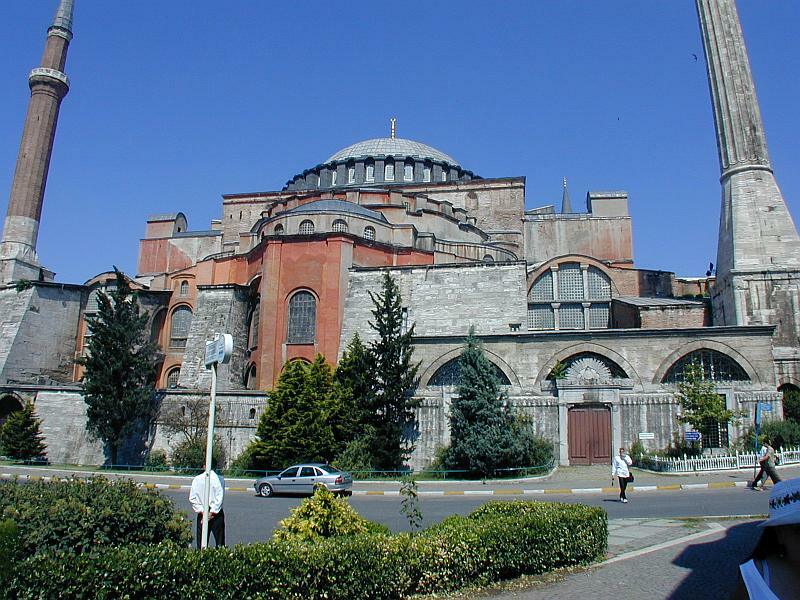 With the Latin occupation of Constantinople between 1204 and 1261, the church became a Roman Catholic cathedral. In 1261, Byzantines captured Constantinople again. In 1317, emperor Andronicus ordered four new buttresses in the eastern and northern parts of the church. With the earthquake in 1344, the dome got new cracks, and the earthquake on 19 May 1346 made the several parts of the building collapse. The construction and repairs held by architects Astras and Peralta and finished in 1354. Till that time, the church remained closed. In 1453 Sultan Mehmed the conqueror amazed at the beauty of the Hagia Sophia and immediately converted it into his imperial mosque and it served as the principal mosque of Istanbul for almost 500 years. Due to the Islamic prohibition of figurative imagery, all the faces depicted in the church's mosaics were covered in plaster and then various additions were made over the centuries by successive sultans. Sultan Bayezid ordered a new minaret changing the previous one of his fathers’. In the 16th century, Suleiman the Magnificent brought two colossal candles from Hungary to be placed on both sides of the mihrab. To the end of the 16th century during the reign of Selim II, famous architect Sinan strengthened the building by adding structural supports to its exterior. He also built two minarets on the western end of the building and the mausoleum of Selim II to the southeast of the building. In 1600s, two mausoleums were added next to Selim II’s, Murad III and Mehmed III. In 1739, during the reign of Mahmud I, a medrese, a kitchen to distribute poor, and a library, and in 1740 a fountain for ritual ablutions were built. As a last in 1934, under Turkish president Kemal Atatürk, Hagia Sofia was secularized and turned into the Ayasofya Museum and became one of the most significant monuments not only in Turkey but on earth with its architecture and its historical richness. The uncovering of mosaics had already begun in 1931 by the leadership of Thomas Whittemore. This time the white plasters covering the mosaics were pulled out, carpets on the floor were removed and the original marble décor could be seen for the first time in centuries. The museum opened in 1 February 1935.